Switzerland - The UN Migration Agency (IOM) reports that 81,292 migrants and refugees entered Europe by sea in 2017 through 18 June, with 85 per cent arriving in Italy and the remainder divided among Greece, Cyprus and Spain. This compares with 215,702 arrivals across the region through 18 June 2016. IOM Rome spokesperson Flavio Di Giacomo reported that at least 4,860 migrants have been rescued off the North African coast since Friday. Some of them were being brought to shore on Monday (19 June), and therefore have not been included in the table above. Di Giacomo also reported that IOM staff in Palermo recorded the following testimony from survivors of this latest shipwreck on Monday: A dinghy carrying 130 migrants sailed from Libya on Thursday. After several hours at sea, the survivors say a group of Libyan smugglers (survivors called them “pirates,” Di Giacomo said) reached the dinghy and stole the craft’s engine. After drifting for a while, the boat capsized. Some Libyan fishermen were able to rescue only four survivors (two Sudanese nationals, two Nigerians) and put them on another dinghy bound for Italy which was in the same area. This second dinghy then was rescued by European patrol ships and brought to Palermo by the Italian Coast Guard ship CP941, which brought a total of 1,096 migrants to shore. According to survivors, the overwhelming majority of missing migrants was made up of Sudanese nationals. Late Monday, IOM Rome reported news that seven more migrants were feared missing and that the Italian coast guard was bringing survivors to Messina. Another landing of survivors in Reggio Calabria brought news that one boat with approximately 85 men, women and children on board was spotted by others who managed to tread water. It is believed some survived and were rescued by the Libyan coast guard. The victims are said to be families with children whose nationalities include Moroccan and Syrian. With these latest reports, IOM’s Missing Migrants Project (MMP) notes total deaths on the Mediterranean this year are now approaching 2,000, and will have passed that mark if reports from Libya confirm a second or third shipwreck. Although 2,000 is fewer than the number of deaths that were recorded at this time last year, it nonetheless marks the fourth consecutive year migrant deaths on the Mediterranean Sea have exceeded 2,000. IOM Libya’s Christine Petré reported Monday that on 16 June, 775 migrants (678 men, 82 women and 15 children) were rescued by the Azzawya branch of the Libyan Coast Guard off Sabrath. The remains of eight men and women were retrieved in the Al Mutred area, west of Azzawya. One of the bodies was retrieved by citizens of the town and the rest by the Libyan Red Crescent. On 17 June, 25 migrants (all men) were rescued off Zwara by local fishermen; 110 migrants are believed to be missing from that incident. On the same day, the remains of one man and one woman were retrieved in Sabratha by the locals. IOM currently is investigating whether these victims may be among the mainly Sudanese passengers who are missing from the incident reported by survivors arriving this week in Palermo (see above). IOM Libya also reports that on 18 June, 123 migrants (including children) were rescued northwest of Azzawya’s shore by local fishermen and the remains of seven men and women were retrieved in the same area. Remains of a further nine men and women were retrieved in Tajoura east of Tripoli by the Libyan Red Crescent. Considering the past days’ rescue missions, the total number of people rescued has exceeded 10,000, bringing the total to 10,034. This year, 277 bodies have been retrieved from the Libyan shores while 10,034 migrants have been rescued in Libyan waters. 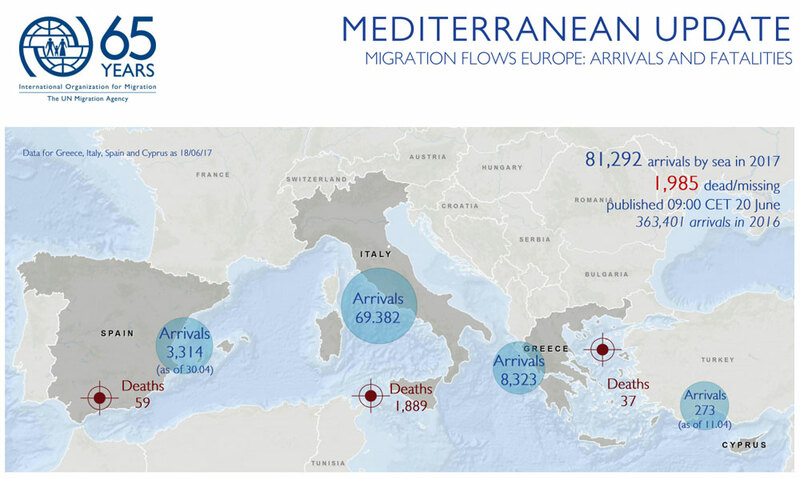 Worldwide, the IOM Missing Migrants Project (MMP) reports that there have been 2,718 fatalities through 18 June (see chart below) with the Mediterranean region accounting for the largest proportion of deaths – over 70 per cent of the global total. In the past few days MMP regional figures have added: one incident from May in which eight Ethiopians were found suffocated inside a truck in the Ruvuma region in Tanzania (they are believed to have been en route to South Africa); five bodies recovered in a boat off the coast of Murcia, Spain; one migrant who reportedly died after falling from a truck in Azzawya, Libya; 26 bodies recovered off the coast of Libya during this past weekend; and 126 missing in a shipwreck off the coast of Libya (as reported by survivors taken to Palermo). MMP also added drowning deaths in the river along the US-Mexico border, as well as several deaths within Mexican borders of US-bound migrants.